ST. LOUIS – Shalane Flanagan used her superior strength to pull away from the rest of the women’s open field while Chris Derrick bested a loaded men’s open race as each claimed USA Cross Country titles Saturday, Feb. 2 at Forest Park. 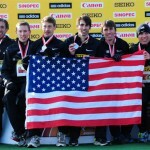 In addition to awarding national championships for competitors in men’s and women’s junior, open and masters competition, spots on Team USA for the World Cross Country Championships, scheduled for Sunday, March 24 in Bydgoszcz, Poland, were also on the line for the top six finishers in the junior and senior races. Complete results from Saturday’s races can be found here. Emily Stites and Oklahoma State’s Craig Nowak also claimed national titles in junior competition as competitors battled steady breezes and temperatures in the 30s throughout the day. 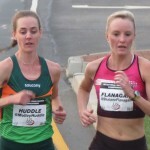 Flanagan set the tone early and by the final two kilometers it proved to be too much to handle as the 2008 Olympic 10,000-meter bronze medalist won her sixth USA Cross Country title in a time of 25:49.0. “It was a lot of fun. The spectators and the fans were phenomenal. At the start and the finish area I could just see fans lining everything. The whole meet was really well run. Overall my race was really great because I had competition until the last 2 km. Kim (Conley) ran really tough. It means a lot more when you have a national championship and someone pushing you the whole way. That was great and I think we will have a really good team going to Poland,” Flanagan said. 2012 Olympian Kim Conley ran with Flanagan through the first six kilometers and eventually finished runner-up in a time of 26:06.0. “I was prepared to go out hard and sink my teeth in and go for it with her. She just had a little more strength than I did over the last 2 km, but it was great to be up there with her. I’m very hungry to win a title one day,” Conley said. Competing less than two weeks before her 40th birthday and in her first cross country race since 2007, Deena Kastor placed third overall in a time of 26:41.0. A veteran to the sport, Kastor has won a total of seven USA Cross Country titles in her career with her first coming in 1997. “I knew that I had some strong competition and that it would be hard to make this team, but I promised to put in an honest effort for a little bit over a half hour, and commit to having a strong race. 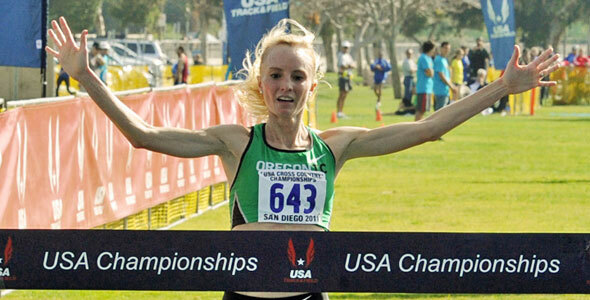 This will be my tenth U.S. cross country team, and 18th international team, so I’m pretty excited to represent the USA,” Kastor said. Rounding out the top five were Emily Infeld, who placed fourth in a time of 26:47.7, and Neely Spence who was fifth in 26:54.2. Running in a tight pack of as many as 25 runners through much of the race, Derrick pulled away from one of the deeper fields in the event’s history. Emerging to place second and third, respectively, were 2012 Olympians Dathan Ritzenhein and Matt Tegenkamp. It was a breakthrough win at the professional level for Derrick, who holds the American collegiate record in the 10,000m and American junior record in the 5,000m and was selected as an NCAA Division I All-American 14 times while at Stanford. Derrick’s winning time was 35:36.6, which was ahead of Ritzenhein (35:44.1) and Tegenkamp (35:55.8). “It went about like I hoped it would. It was a little slower at the front. I figured Dathan (Ritzenhein) would make a big move and I wanted to go with him. When he first moved I didn’t know if he would be able to do that because we were really rolling. One of my favorite tactics has always been to crest the top of a hill then go. That set up perfectly with 2 km to go,” Derrick said. The trio spent the duration of the race near the front of a large pack that included Elliot Heath and Ben True, who placed fourth and fifth, respectively. 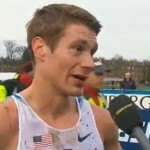 Ryan Vail and 2012 USA Cross Country champion Bobby Mack were also in the mix and placed sixth and seventh. Stites and Erin Finn broke away from the rest of the pack early before Stites then made it a solo race in cruising to the victory in a time of 20:27.3. Finn, the runner-up at the 2011 Foot Locker Nationals, finished second in a time of 20:48.6. Following Stites and Finn, the quartet of Colorado’s Carrie Verdon, Kathryn Knight, Samantha Nadel and Sydney Scott all finished in a bunch to all secure their spots on Team USA for the World Junior Cross Country Championships. Verdon finished third in a time of 21:08.8. Knight was fourth in 21:09.3 and Nadel fifth in 21:10.3. Oklahoma State freshman Nowak ran easily through the finish to win in a time of 24:47.0 as a group of five battled for second place. Wisconsin’s Malachy Schrobilgen was able to pull ahead and finished second in a time of 24:51.2 and Matt Mclintock was third in 24:51.9. Darren Fahy, Thomas Graham and Andrew Gardner all also secured their spots in Poland by finishing in the top six. Jody Hawkins (W46) took the lead from the start and continued to pull away through the finish to win her age group and the women’s masters USA Cross Country overall title. Hawkins pulled away from her close friend Carmen Ayala-Troncoso (W53) to win in a time of 22:30.0. Hawkins finished second overall and won the masters 50-54 year old age group in a time of 23:06.90. Cindy Blakeley-Came (W48) finished the race third overall and second in her age group in a time of 24:07.5 while Kelly Vandermaiden (W40) was the fourth overall finisher and also won her master’s age group in 24:16.7. Pamela Di Guiseppe (W45) finished fifth overall (25:21.0). Also picking up wins in their age group in women’s masters competition were: Catherine Utzschnei (W57), 26:35.0; Donna Swanson (W60), 32:58.0; Linda Frisby (W65), 30:07.0; Ellen Nitz (W72), 37:18.0; Judith Smythe (W75), 41:04.3. Less than one month after his 40th birthday, Ahrlin Bauhman (M40) was able to outlast Raymond Pugsley (M43) to finish as the top overall finisher in the men’s masters race as men in the 40-44 age group grabbed the top eight overall spots. Bauhman won in a time of 25:57.7 and Pugsley’s second-place time was 26:02.6. Rusty Snow (M43) placed third in 26:09.2. Also picking up wins in their age groups were: John Mirth (M50), 27:12.1; Matt Wegenka (M48), 27:48.9; Mark Rybinski (M57), 29:49.9; Ignacio Jimenez (M63), 30:36.4.